It’s a bit pricey as night lights go, but would make a nice accent piece. There are also a couple of larger chandeliers meant for overhead lighting that would look good in a bedroom or dining area, such as this and this. That isn’t a set of words you really ever expect to see strung together in quite that order, but apparently the folks at The Pyramid Collection have a little too much time on their hands. 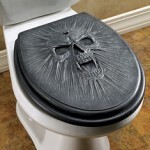 Anyway, in addition to the monster commode shown here, they also offer a dragon and what they describe as “Gothic” in, presumably, the architectural sense: The lid looks like a knight’s shield and the seat features real chain mail embedded in clear lucite. Any kid who likes mysteries has probably longed for a book with a secret compartment in it; I know I certainly did. User Aud1073cH at the How2DoStuff blog has posted easy instructions for creating one out of a thrift-store hardback. The comments on the post are also useful, with suggestions such as using a dremel tool to speed up the page-cutting process. Go forth, and indulge your inner super-secret spy! Here’s a handy little resource for the morbidly inclined: Etsy’s Dark Side is a MySpace page devoted to finding and promoting Etsy stores that feature “dark” crafts. There’s all kinds of fun stuff to explore, from handbags with fangs to unusual jewelry to really creepy dolls. There’s some wonderful inspiration to be gleaned from these sites as well. Go check them out! In much the same way that the original Sesame Street was inappropriate for children,* The Muppet Show was marvelously dark and subversive. The other day I got to thinking about one skit I particularly got a kick out of, and was delighted to discover that it’s been uploaded to YouTube. This is Marisa Berenson singing Shel Silverstein’s You’re Always Welcome at Our House. *Does this make your head swim? It does mine. Photographer Joshua Hoffine creates amazing hyper-realistic photographs of horrible things. He stages his shoots like “small movies,” using elaborate props, special effects, and lighting, and his works are actually photographs rather than digital collages. Many of his works involve small children in terrifying situations (such as the one shown here, entitled “Basement,” from the series “After Dark, My Sweet”), to greatly unsettling effect. His site states that he uses friends and family as actors, so hopefully the kids just view this as a fun way to help Daddy instead of nightmare fodder. His whole site is Flash-based, which I Hate! So! Much! but his portfolio is worth the pain of the interface. Go look, and cringe a little. You could go a step further and paint or decorate the limbs, too: Draw tattoos with a permanent marker, give them fishnet gloves, paint their toenails, or use black electrical tape to create the look of fetish vinyl. Then be prepared to have a pile of hats on your floor because your guests won’t go anywhere near this thing. My recent post about the “save the imaginary creatures” campaign reminded me about the marvelous Dead Fairy April Fool’s hoax in 2007. Many respected news agencies and hundreds of Websites reported that a man in the UK had discovered the mummified remains of a fairy while walking his dog near an Iron Age barrow. The body, about 8 inches in length, was complete with wings, skin, teeth, and long flowing hair. The creature was actually the creation of magician and prop maker Dan Baines from Lebanon Circle, who eventually came clean about the prank. The original fairy sculpture was sold on eBay for nearly £300 (ten zillion current US dollars). Mr. Baines started making dead fairies for sale, although his gallery suggests that maybe he’s sold out for now. It seems to me that this is fertile ground for a homemade prop. From the photos on the site, the original fairy looks like an armature covered with latex. Its “wings” seem to be partially-skeletonized leaves. If you’re feeling ambitious, something similar might be done by corpsing a miniature skeleton (such as Anatomical’s Petite Pete) and adding embellishments like doll hair and skeletal wings. Pop it in a specimen jar or stretch it out like a pinned butterfly and display it proudly. 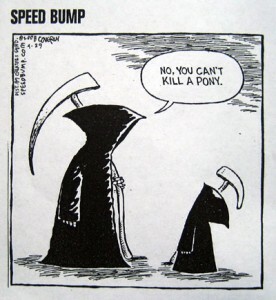 I’ve mentioned Morbid Tendencies previously, but wanted to highlight their Unfortunate Animal of the Month Club. The subscription is $50 a month (slightly higher for subscriptions of less than 3 months), you can specify the type of creatures you desire, and you even get to choose a Morbidity Rating (ranging from “Slightly Twisted” to “Sick”). Every critter is hand-made, and the artist strives to personalize each beast to the particular nuances of your correspondence with her. If you’re handy with a needle, the photos are also an excellent source of inspiration. Fun!